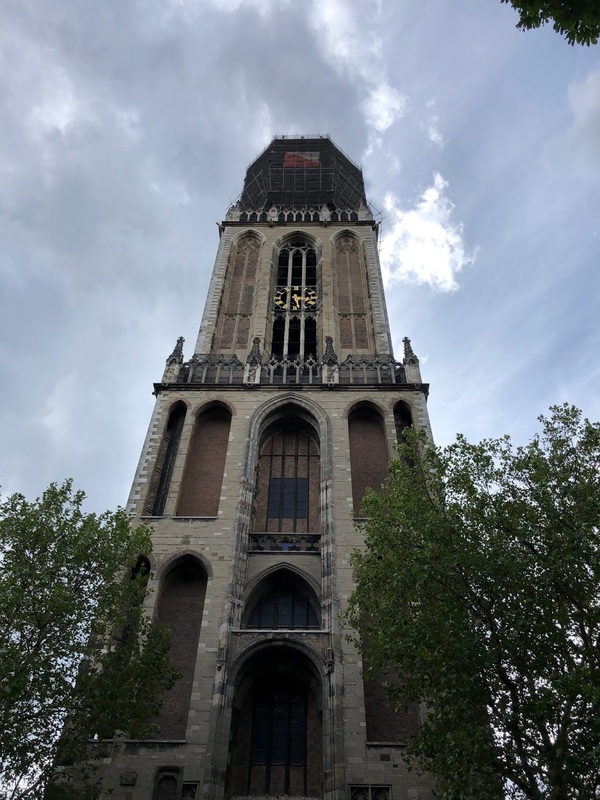 I have visited Utrecht in the Netherlands before but this was the first time I had been involved in the Utrecht Early Music Festival: Festival Oude Muziek Utrecht - the largest early music festival in the world. 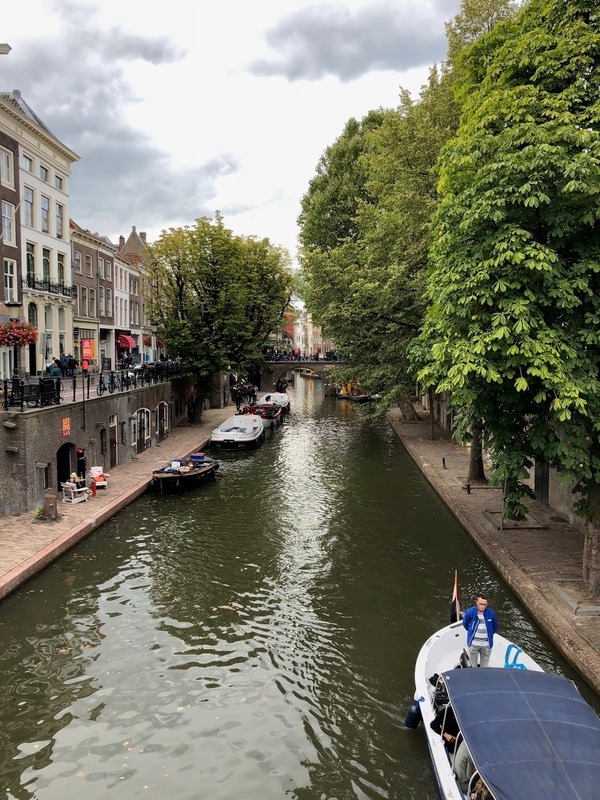 The opening of the festival took place on Friday 24th August 2018 with four simultaneous concerts across Utrecht’s city centre. The overall title of the opening night was Het Bourgondische Leven (The Burgundian Life) and each ensemble played a short programme four times (around 20 minutes of music, with a 20 minute break) for different audiences. 'Confréries', performed by Graindelavoix (Björn Schmelzer), took place in the Nicolaïkerk and featured music by Pierre de la Rue (c.1452 - 1518), Jean Mouton (c. 1459 - 1522), Josquin Desprez (c. 1450/5 - 1521), Loyset Compère (c. 1445 - 1518), Johannes Ockeghem (c. 1410 - 1497) and Jacob Obrecht (c. 1457/58 - 1505). 'Busnoys', performed by Cantica Symphonia (Guiseppe Maletto), took place in the Catharinakathedraal and featured the Missa L’homme armé: Gloria - Sanctus by Antoine Busnoys (c. 1430 - 1492). 'Couperin', required a choice between hearing the harpsichordist Paolo Zanzu in Kytopia or hearing the harpsichordist Bob van Asperen in the Lutherse Kerk. They played different pieces by François Couperin (1668 - 1733). 'Rameau', performed by Vox Luminis (Lionel Meunier), took place in the Domkerk and featured music by Jean-Philippe Rameau (1683 - 1764), François-André Danican Philidor (1726 - 1795) and Michel Richard Delalande (1657 - 1726). Their programme was based on that of a performance given for King Louis XV of France in 1744, the monarch known as Le Bien-aimé. The well-beloved King had fallen gravely ill in August 1744 in Metz. 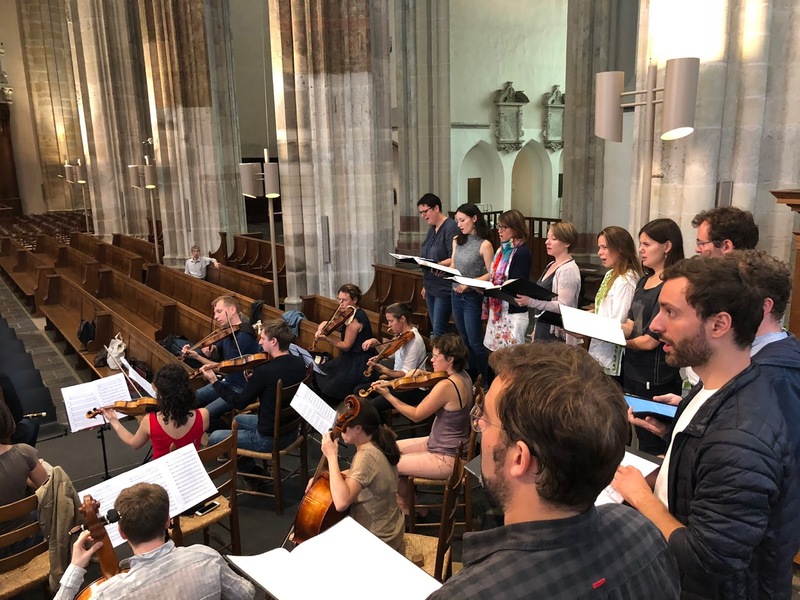 As well as prayers, music (including a Te Deum) was performed to encourage the King’s return to health - and that concert was the inspiration for Vox Luminis’ programme, performed on the opening night of the Utrecht Early Music Festival in 2018. Although we (the trumpets) only played in the Philador and the Delalande we had the pleasure of listening to the stunning vocal piece by Rameau, Laboravi. I really enjoyed listening to this piece. These four renditions were considered to be the modern premiere of this piece, which had been reconstructed by Dr. Graham Sadler. Speaking of reconstructions, the Rameau was not the only piece in the programme to have elements of reconstruction. Although the Delalande is (on paper) scored for two trumpets it is likely to have been played by more than two trumpet players, with improvised or devised middle parts. Pieces such as Delalande’s Te Deum were probably played by the 'trompettes des plaisirs du Roi’ from Versailles - four elite trumpet players carefully chosen from the 24 trumpet players of ‘la garde du corps’ (the King’s bodyguards). These trumpet players may not all have been able to read musical notation so it is thought that the middle parts would have been improvised, devised in rehearsals or taught aurally within the trumpet section. 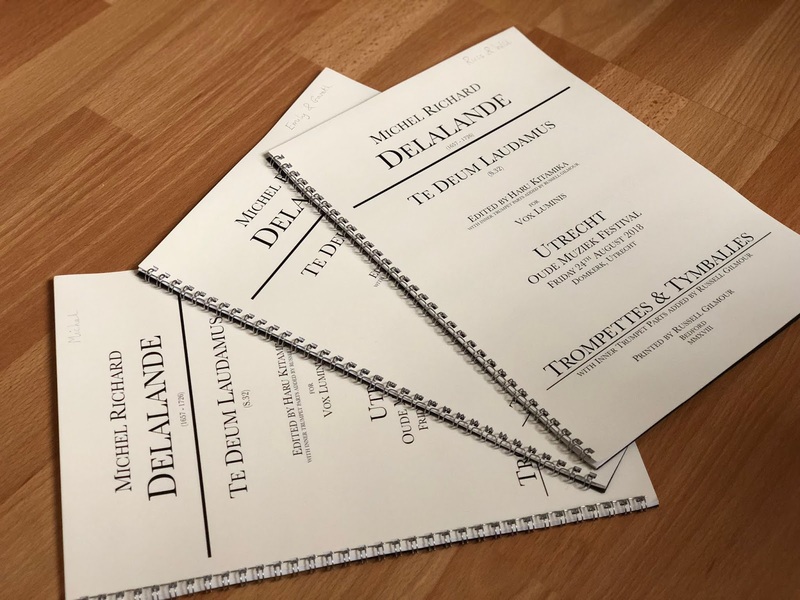 Delalande wrote the tune in the first trumpet part and the fourth trumpet part is very similar to the timpani part, requiring frequent use of the pedal (2nd harmonic). Just as continuo players often play from a short score with a figured bass, these 'short score' trumpet parts would have provided the players with an outline for the inner parts to work within. In the time we had available before the first rehearsal and subsequent performances it was not pragmatic to rely on improvisation, or any of the other possible methods of deriving the inner parts mentioned above. I asked the editor Haru Kitamika to send the digital (editable) files and she kindly obliged. I added two new staves for the second and third trumpet parts and began devising my own inner parts. I wrote these inner parts by combining other elements from within the piece, using the other instrumental and vocal parts as evidence and as a framework. Other inspiration came from the experience of playing similar pieces and other trumpet ensemble music by similar French baroque composers. The inner trumpet parts that resulted were written to be practical and pragmatic (as opposed to being strictly scholarly). In studying the existing timpani part, with its extravagant semiquaver triplets, it was clear that elaboration was within the spirit of invention in this piece and so I wrote parts that were similarly ornamented. While I was writing the parts I had no idea of the tempo at which the ensemble would choose to perform these movements. I wrote elaborately ornamented inner parts that could be played as written if a slow tempo was chosen. I wrote these parts with the reassuring thought that it would be easier to simplify the inner trumpet parts (than to spontaneously, simultaenously and coherently elaborate on them) if a faster tempo was chosen. Indeed we did simplify some of the triplet semiquaver rhythms to just semiquavers (there is a recurring mismatch [presumably original, though I have not seen the manuscript] when the timpani has three triplet semiquavers and the fourth trumpet, meanwhile, has two straight semiquavers). Nevertheless, the ensemble sounded very together and I was exceptionally pleased with the end result of the ‘realised’ trompettes. I was incredibly pleased with the trumpet section and the realisation of the new parts in the Delalande. The section featured: Russell Gilmour on first trumpet, William Russell on second trumpet, Emily Mitchell on third trumpet and Gareth Hoddinott on fourth trumpet. Will and Emily played the new inner trumpet parts with great aplomb and Gareth played the fourth part (which frequently uses the second harmonic) with accuracy, a great sound and crucially not too loudly - which is a real skill. The energy, the concentration and the stamina required to play the same programme four times in quick succession was interesting. 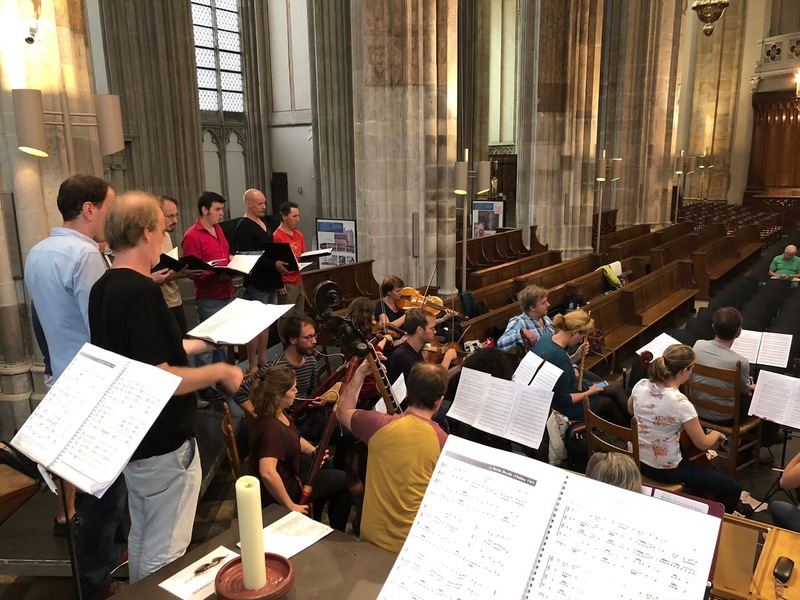 While stamina was initially a concern of mine (the A section of Delalande’s Te Deum Laudamus repeats relentlessly, being in rondeau form) but it was actually not a problem in the generous acoustic of the Domkerk. The trumpet ensemble also played a Marche Royale by Philador which directly preceded the Te Deum. Thanks to a timpani introduction (played by Michael Juen) of eight bars, this allowed us a brief respite between the end of the Marche Royale and the beginning of the Te Deum. 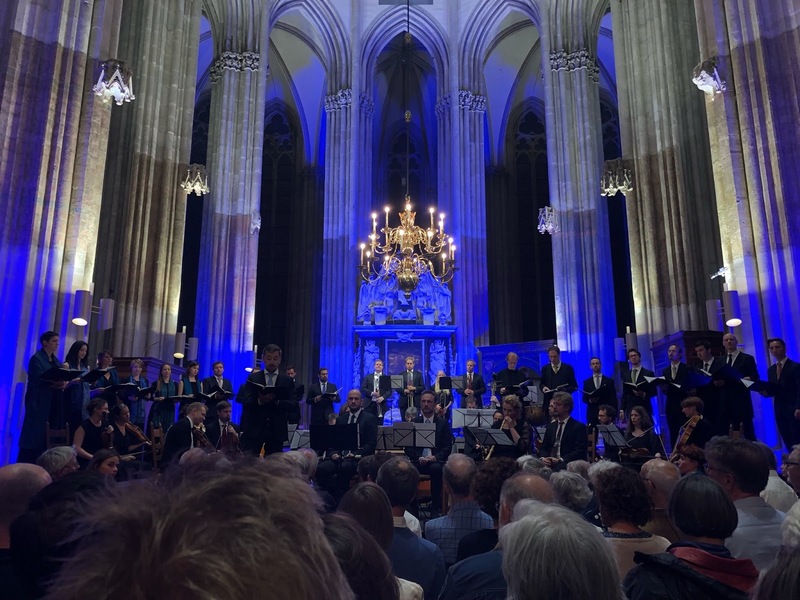 It is a real pleasure to perform with Vox Luminis and it was a very interesting learning process for me to create and realise the inner parts for the Delalande, and it makes me wonder what other French music could be artfully realised in a similar way. 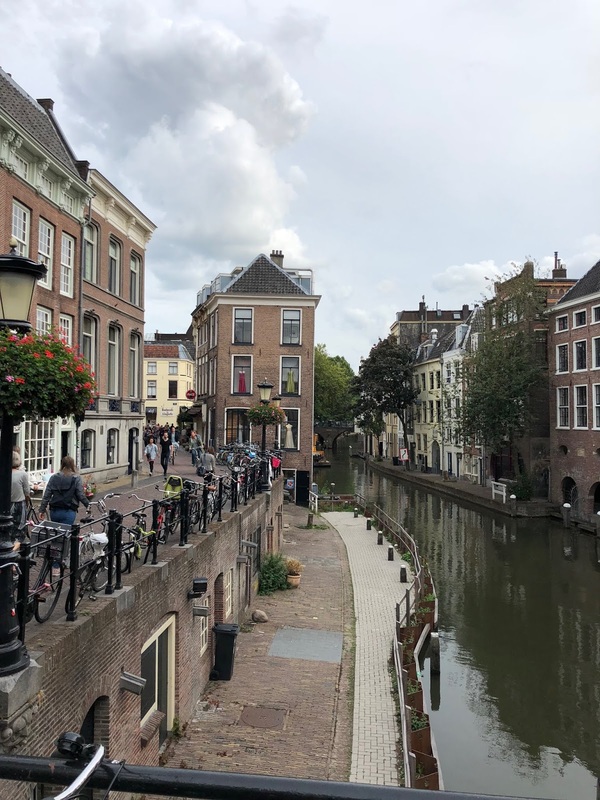 I thoroughly enjoyed being in Utrecht, and I was thrilled to have travelled there entirely by rail from London (on the new direct Eurostar link to Amsterdam). After Utrecht, I travelled to join I Fagiolini for a further performance their production of Monteverdi’s L’Orfeo, this time in the AMUZ festival in Antwerp.